So at just over 33 weeks pregnant we are finally getting most things sorted out for Baby's room. It's taken us awhile as we still had boxes in there from when we moved in,during August that needed sorting. Plus we only really just got around finding space for near enough everything. I knew when it came to the furniture in baby's room that I wanted all the furniture to be white. Luckily Stuart has agreed and over the last few months I have been browsing and trying to find the best items at great prices. We are living in a rented flat and baby's room is painted sky blue. But as we don't know baby's gender I have been looking to some ideas to make most of the blue walls by using accessories that are gender specific which I will look more into once little one arrives. 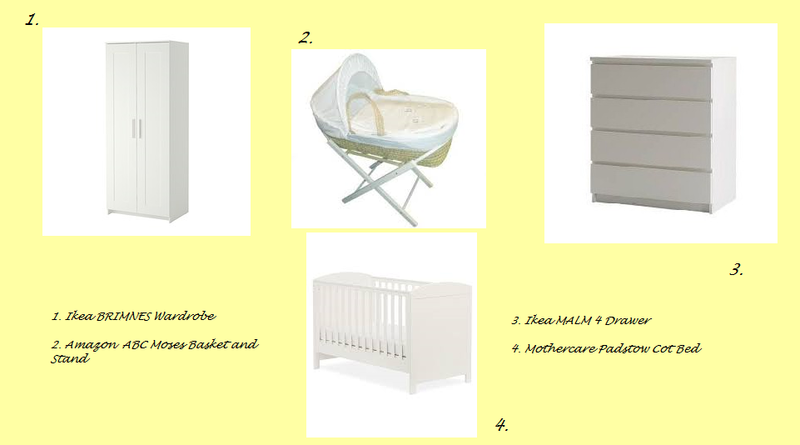 Onto the furniture we have chosen to go for the BRIMNES 2 door wardrobe (1) from Ikea. I like how this wardrobe has a shelf so that you can fit folded clothing as well as short and long hanging items. My mum (even though we have one to borrow) decided to surprise us and buy us a new moses basket for baby (2) I am looking forward to it arriving as it does look gorgeous. It comes with hood, mattress, quilt and white folding stand. We have also chosen to go for the MALM (3) 4 chest of drawers which I am looking forward to organizing. Then last of all we have the Padstow Cot Bed (4) from Mothercare which was a gift from Stuart's Mum. We managed to get it on special offer and we also brought a mattress separate for it on special offer too. We wanted a cot bed so that it would last our baby until they reach the age of 4. Once baby is here I am looking forward to getting the bedding etc for the cot and kitting out the room properly.